I've been going through the archives and found something special to share with all the great Crash fans. I'll be following up with more in the days ahead as there's quite a few drawings of this fellow. These are the very first development drawings of Dingodile who made his appearance in Crash Bandicoot 3. They are dated February 4 1998. Looks like I came up with a high volume for work on that day for this character. You'll see more in follow up posts. These were very happy times. Probably the best time as far as my relationship with Naughty Dog was going. I started my school just a couple of weeks before this and everything was in high spirits. When I came in to work on the project I was in the corner conference room on the top floor of the main office complex at Universal Studios. That's where ND was located before they left Universal to go on their own. A fun place to create. The idea was to come up with a character that was half crocodile and half dingo. These sketches are my very first attempt at building out the concept. I don't know if they've ever been shown before. I think most of what you'll be seeing is a first in publication. Hope you enjoy these drawings guys. I'll be featuring more soon. One of my favourite characters! 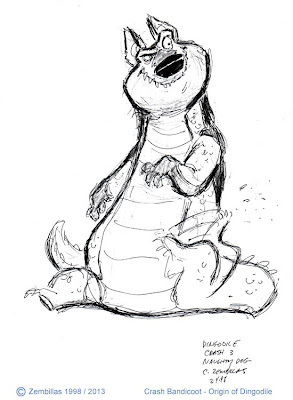 Oh my God Dingodile is so awesome in this drawings! The flamethrower was added after you estabilished the design or before? @Matt: I think it's just luck. 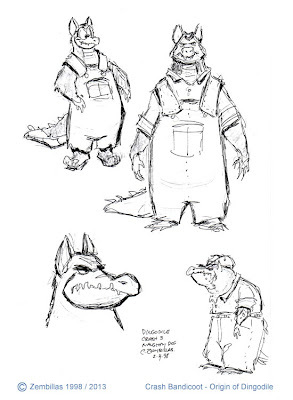 How very nice to see some Crash 3 art, especially of fan favorite Dingodile. You're right in that these were never shown before. 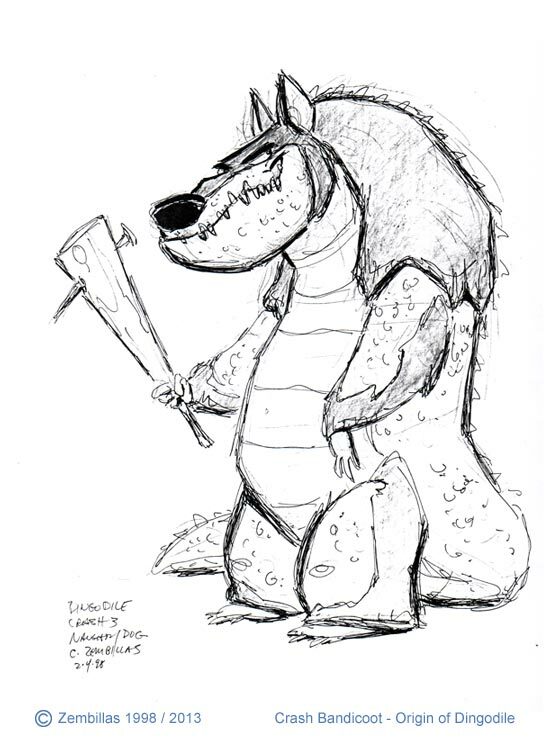 I've always had the feeling that Dingodile was a fun character to work on. Wow Charles! These are amazing to see for the very first time! The face on the first two remind me of Tiny! Was it your idea to give Dingodile a flame flower? Dingodile was fun to work on. I did a lot of development on that day and nailed a strong character. He was a highlight of my time on Crash. Matt, can't tell you about the CTR stuff cuz that's all ND. The flame thrower was my idea. ND wanted him to have a game play attribute. They wanted him to be a flame breathing character like a dragon. I said give him some technology instead and I came up with the flame thrower. 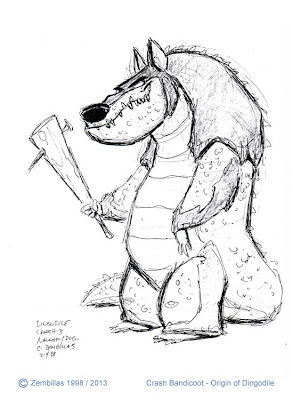 There's a good amount of art from Dingodile on the way. I think you'll like it. Thanks for checking in guys and for your comments. Hey Charles, did you design the Motorcycle and the War Planes in Crash 3? Also, were there some scrapped ideas of yours that didn't make it in the Crash games (i.e. vehicles, gadgets, etc...)? A Dingo/Crocodile hybrid with a flamethrower. You are a genius. I have the same question of Pat: Did you had ideas that weren't used in the games? Pat & Gabriele, I didn't design any technology other than Crash's jet pack. Usually ND would have an idea as to what they wanted with a character and I'd go from there improving upon the initial concept. Matt, I'm an American born in the USA of Greek ancestry. So then is how dingodile was born, a good beggining.